Why are the founding figures of major religious faiths credited with superhuman qualities? The founding figures of various religions are usually believed to have superhuman qualities, such as omniscience, ability to predict the future, impeccable control over their own emotions, invulnerability, miraculous healing powers, and so forth. An absolute conviction about the unquestionability of such beliefs form the bedrock of many religious faiths. What is the psychology behind such compelling collective beliefs? How does one analyse them in terms of various psychological parameters? Perhaps the most compelling explanation of the origins of religions using purely psychological explanations is the theory of religious figures having a high incidence of frontal lobe epilepsy. Of course, this doesn't explain their rise in influence and - which I think should be left to historians since it goes beyond the realm of science that could prove to be reductive and merely speculative in this case. Where religious ideas are expressed in words (e.g. transmitted through oratory), it is likely that the orators themselves will rise above the common herd. Most religious traditions of this sort have cel- ebrated leaders, who may take the form of gurus, messiahs, prophets, divine kings, high priests, mediums, visionaries, disciples, or simply great evangelists or missionaries. The very fact that there are so many different types of, and terms for, religious leadership is an index of how widespread and important the phenomenon is. Partly through their skills as orators, these leaders become marked out as special. But, at the same time, their pronouncements (real or attributed) pro- vide the central tenets of a belief system, and their deeds become the basis for widely-recounted religious narratives, transmitted orally. Both forms of knowledge are stored primarily in semantic memory. 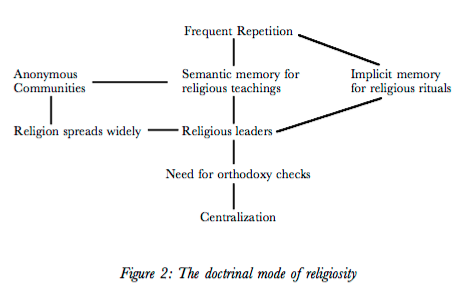 Modes of Religiosity: a cognitive theory of religious transmission. Walnut Creek, CA: AltaMira Press. "Religious Thought and Behavior as By-Products of Brain Functions"
Inside the Cult: Religious innovation and transmission in Papua New Guinea. Revered in some cultures but persecuted by most others, epilepsy patients have, throughout history, been linked with the divine, demonic, and supernatural. Clinical observations during the past 150 years support an association between religious experiences during (ictal), after (postictal), and in between (interictal) seizures. In addition, epileptic seizures may increase, alter, or decrease religious experience especially in a small group of patients with temporal lobe epilepsy (TLE). Literature surveys have revealed that between .4% and 3.1% of partial epilepsy patients had ictal religious experiences; higher frequencies are found in systematic questionnaires versus spontaneous patient reports. Religious premonitory symptoms or auras were reported by 3.9% of epilepsy patients. Among patients with ictal religious experiences, there is a predominance of patients with right TLE. Postictal and interictal religious experiences occur most often in TLE patients with bilateral seizure foci. Postictal religious experiences occurred in 1.3% of all epilepsy patients and 2.2% of TLE patients. Many of the epilepsy-related religious conversion experiences occurred postictally. Interictal religiosity is more controversial with less consensus among studies. Patients with postictal psychosis may also experience interictal hyper-religiosity, supporting a "pathological" increase in interictal religiosity in some patients. Spirituality and religion in epilepsy. Epilepsy Behav. May 2008 ; 12(4):636-43. "Norman Geschwind's contribution to the understanding of behavioral changes in temporal lobe epilepsy: the February 1974 lecture". Epilepsy Behav (Biography, History article) 15 (4): 417–24. "Hypergraphia in temporal lobe epilepsy. 1974." Waxman, SG; Geschwind, N (March 2005). Epilepsy & behavior : E&B 6 (2): 282–91. Not the answer you're looking for? Browse other questions tagged social-psychology sentiment-analysis or ask your own question. What is the psychological basis for people coming together during a disaster or major event? Is the desire to impress others a major goal? Why are most popular humans pets carnivores? How does an understanding of the brain explain why people experience strong emotional responses to major sporting events? How successful are modern (2015) sentiment analysis algorithms for identifying emotion? Do people struggle to empathise with people who are very different to them? Why are people biased against overweight people? Why do people are seeming more charistmatic or sympathic, if they are fans of old things? Why do some people bond with their captors and vice versa?